I think it was when I'd cycled 25 miles (in one go) that I went from being somebody who rode a bike to being a cyclist. There is a clear distinction between these two groups; the main one being that I would actually buy 'Cycling Active' and not just browse through it on WH Smith's shelf. The buying of the magazine coupled with the internet and a PayPal account meant that our blue re-cycling bin was now transformed into a drop box for deliveries of cycling purchases. The Giant Rapid was only the start of the spending; bottle cage, water bottle, pump, seat post bag, multi tool, spare inner tubes and puncture resistant tyres were the first batch of items to be dispatched over the world wide web. The puncture resistant tyres were a Godsend as the first weekend I had been out I had three punctures. The first came on a wet and windy Saturday and I was at least six miles from home and had not yet purchased a pump! Luckily a passing cyclist had stopped and lent me some air from his pump. On the Sunday of the same weekend two more followed, I gave up with the third and called my wife to come and fetch me in the car. Most weekends I was now going out on rides and I was amazed at the amount of quiet lanes around my home, and I was finding villages that I had no prior knowledge of. My commute into work always took me on the same main road in and I was amazed at how much was around me. In one copy of 'Cycling Active' there was a route that was on my doorstep and went onto the Humber foreshore (on a bridleway I didn't know existed) – doing the ride was the day I managed twenty five miles). I now found myself actively seeking out cycle routes and realized that there were a number of off road trails nearby. Having bought the Giant as being a 'non racer' I could see (if only from the number of punctures) it wasn't a hybrid but a 'straight bar road bike'. These were new phrases I had developed from reading numerous reviews of bikes. Still convinced the Giant was the best thing to be riding on the road I started looking at more rugged Hybrid bikes. Not wanting to be caught out again and trying to keep the level of spending hidden from my wife I sorted out all the bling at the time of purchase eg pump, bottle cage, seat post bag. It only took a couple of off road rides to realize that I wanted to be an on road cyclist! Most off road bikes seemed to driven around on the top or back of cars in search of 'the perfect trail'. What appealed to me was being able to ride from my front door and head into the country. I now had three bikes and the most sensible solution was to buy a fourth! On my weekend rides I had seen other cyclists out and about (and mountain bikes on the top of cars) and tried to see how the bikes compared to my Giant Rapid. The most striking difference was that virtually all of them were racers! Of course, no longer a novice I realized they weren't called racers. Since my youth Marathon bars were now Snickers, Opal Fruits were Starburst, and Spangles, like the Raleigh Chopper had disappeared all together and racers were now simply road bikes with drop handlebars. And so I now embarked on another buying mission. To appease my wife I promised that I would sell at least one of the bikes. My wife was not the only one who had misgivings about my cycling. Our dog knew when it was a weekend as I was normally the last up and he knew he would get a walk to either the pub or the newsagents – he now saw me coming downstairs in lycra and knew it wasn't going to happen. In the four months since buying the Rapid I had been out riding every weekend, some week nights, bought every copy of Cycling Active and Cycling Plus, three copies of Cycling Weekly, one copy of Mountain Bike UK but shied away from Cycling Pro (still too early). I had watched every stage of the Giro D'Italia, converted to clipless pedals, had interchangeable bike glasses and commuted to work at least one day a week (a thirty mile round trip). All of this meant that I could justify (to myself) abandoning the £500 limit on a new bike. Unlike the Scott I now knew not to just be swayed by a colour scheme. However black or red would be best to fit in with my cycling attire. I had made some notes to help me narrow down my new purchase. a. It had to be Italian (the passion of the Giro on TV had gripped me). b. It had to Campagnolo equipped (see point a). c. It had to be no more than £1000. d. It had to be red or black. And that criteria led me to buy a Wilier La Triestina. The list price was more than £1000 but I managed to get a brand new one on Ebay for only £628. I felt guilty buying from Ebay as I had led Cliff Pratts Cycles to believe I was going to buy an £800 Wilier Escape from them but this was an absolute bargain. To lessen my feelings of remorse I paid Cliff Pratts to set up the La Triestina and bought the bling from them (computer, bottle cage and pedals) and for complete absolution a new pair of shoes (even though they were £20 cheaper from Wiggle). The outgoing column of my cycling expenses was now pretty full, to make an entry in the opposite column I sold the Giant Rapid and the ancient Claud Butler. The Claud Butler went for £23.65 and the Rapid for £250. I felt a little shame to see the Giant go as it had got me back into cycling – but at least it went to a good home. The chap that bought it within an hour of it being listed on Ebay drove up the next day from Cambridge to collect. He was desperate to get it as he wanted to ride it to work as soon as possible. When he asked why I was selling a pristine condition bike, I lifted the cover off the Wilier and I swear he made a move to put his money back in his pocket. The Scott was now a weekday commute bike (with the chance it might one day get to go off road) and the La Triestina was my full bloodied Italian beauty for the weekend. It was just as well I now had a proper road bike as I had paid to enter the 100km Big G East Yorkshire Sportive that was only eight weeks away. Post by Francis Brogden – a sequel to Choosing a new bike: "A little knowledge..."
Posted by Francis on September 21st, 2011.
the internet and a PayPal account meant that our blue re-cycling bin was now transformed into a drop box for deliveries of cycling purchases. LOL. I know the feeling well. It amazes me how I seem to find something new to buy just about every week! As a teenager I had a book called 'Let's Go Cycling' which went into detail on the difference between a cyclist and a mere bike rider. I don't recall it mentioning an obsession with buying new toys though! You certainly got a bargain with that Willier, its a steal at that price. Italian bikes definitely have class. Hook, line and sinker ... 😯 . I like your disciplined approach of determining priorities before purchasing (colour scheme is very important). You make the interesting distinction between being somebody who rode a bike to being a cyclist. My recollection of bikes in the Netherlands is that most people would be categorized as "somebody who rode a bike". Does this relate to Patrick's observations regarding cycling intensity in that country? By the way, when does Madame Willier tackle her 100km? From 1985 – 2008 I rode a bike without much interest in cycling as such – or even in bikes. I just enjoyed regular riding, off-road mostly. 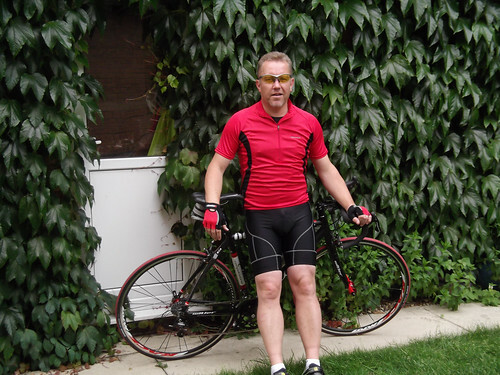 I'd say you become 'a cyclist' when you start to think of other cyclists as being 'like you' – this happened to me in 2008 when I bought my touring bike and joined the CTC. Cyclists (or bike riders) in the Netherlands... I was thinking I might write something about different types of cyclist. I can think of twenty types off the top of my head. I like your style – adds a touch of class to my otherwise uneducated ramblings! Francis wrote: "... and trying to keep the level of spending hidden from my wife..."
Ooh, that's a slippery slope, but I know what you mean. You need the stuff, but also a whole new level of negotiating skills to justify the expense. You've probably got the same 'personalised' email from Wiggle, but here's a link to Bike Radar's forum. As a female 'otherhalf' myself, its best to let her have her own way no matter what! Then you can buy what you want too! My other half collects junk... He calls his junk Classic Motorbikes and Vintage tractors. He is off to Stafford next week for more junk. I even have his junk in my kitchen, in our bedroom (petrol tanks under the bed) and a piece of junk called a 'Widow Maker' in the front room as its dryer there to keep rust at bay. My other half can NEVER complain what I spend money on... EVER!! So be the most patient of otherhalfs, let her have her space to do what she wants, when she wants to, and let her buy stuff for her own hobbies and personal space. Then you can get that shed you dearly need, and fill it with steel framed bikies till your hearts content! The expense goes on! 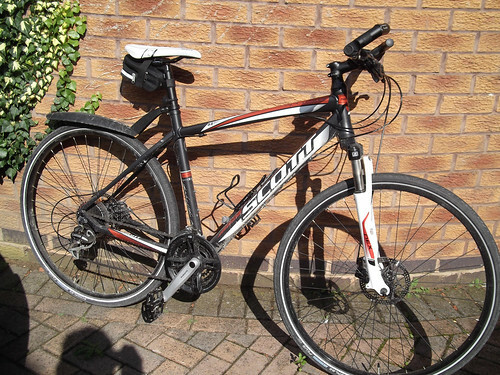 I have a turbo trainer arriving (i'm too fairweather) and I have read conflicting reports about running 'a good bike' on one – so i'm trawling ebay for another bike to run on it. I've already set up a TV and DVD player in the garage to cycle to! Chris – loved the link. It's amazing how many people are in the same fix! This wasn't going to be a fad to fall in and then out of love with. The train set, the gym membership, classic car renovation, the vegetable patch and going tee-total; these were all one night stands leading to my new true love of cycling. Mary wrote: I even have his junk in my kitchen, in our bedroom ... He is off to Stafford next week for more junk. If buying cycling magazines is a sign of being a cyclist, then I confess to merely riding a bike (or three). But I still buy the bling, of course. I havnt rode a bike for years, I bought a rapid 4 last week brilliant bike, completed a 28 mile ride the other afternoon between Barton on Humber & Brigg ,some point in the day ! Every day, I pop out just for a quick blast over the Humber bridge and back. I am hooked.